If bouldering is your sport, lose yourself in the Carcass Crag. This great area is perfect for everyone. With over 20 routes you can pick and choose all day, with several large boulders sporting routes that seamlessly keep you moving. The Antelope is a three star that tantalizes from below as you look down upon Carcass Crag from the top. From the road, you’ll hike down into area, which thanks to its southern exposure gets good afternoon sun in the winter. 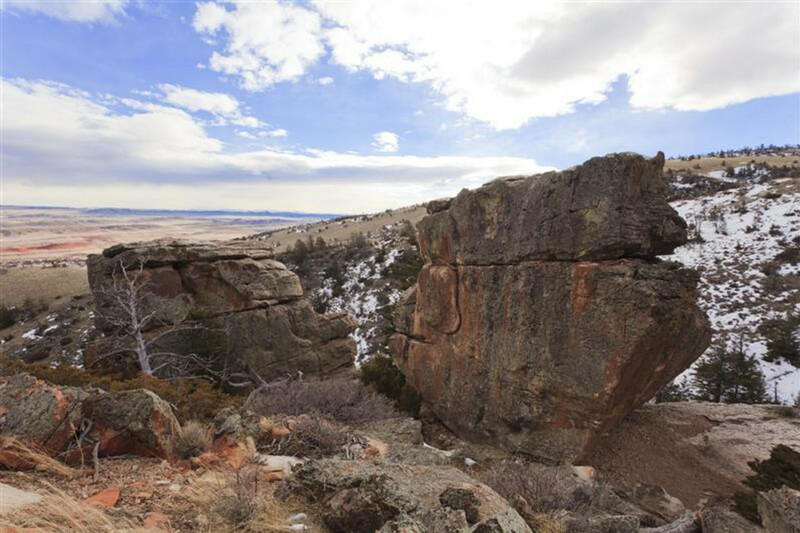 You can’t miss the playground of the Antelope as it’s the first boulder you’ll come to. The variety of problems on solid sandstone make for a champion area. There are so many great features it’s hard to isolate a few. Besides Antelope Boulder, there’s the Visionary and several others. On Antelope you’ll discover V3-V10 routes that link up so you can up keep scaling up and across. Crimps are the name of the game here and all routes on Antelope finish on the ledge above the bulge. The landing pad is great for hanging out. Check out the west face of this three-sided boulder. It’s a climber’s happy place. From Antelope and Visionary the rest of the Carcass Crag area lies downhill, with something to please everyone. 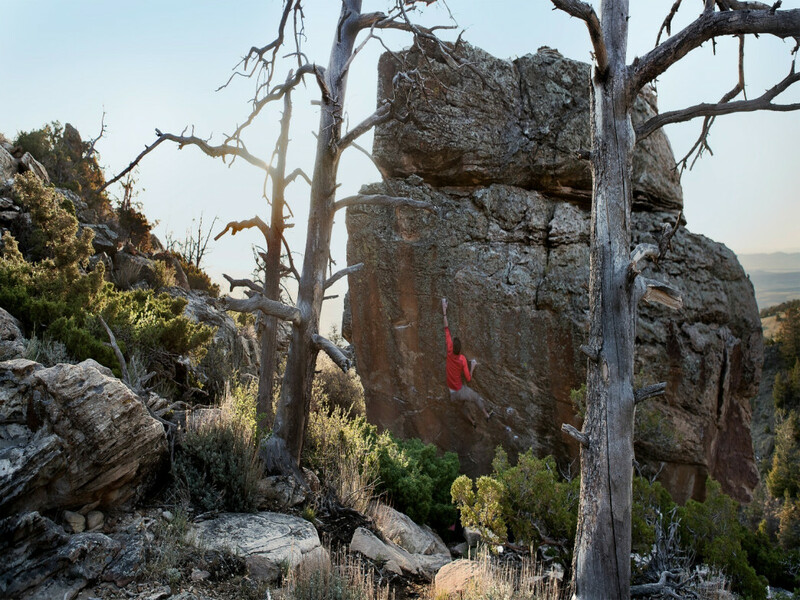 Beginners will want to start below Antelope and Visionary Boulders on some less technical routes. Carcass Crag will challenge you and force you to progress as a climber. This is a great area for groups as everyone can spread out and find a route perfect for them, yet you’re not so far apart you’ll feel totally isolated. Nobody’s going to get bored here. The rock is solid and you even have some trees to get out of the blinding glare of the sun. In summer this area can be exquisite in the early morning or late evening. For an extra long circuit, hike down the slope to play in the Stonehenge area. You’ll want to do a car shuttle and leave a vehicle at Stonehenge. After a day on the rock you’re not going to want to hike back up to the vehicle you left above Carcass Crag. The road is deceptively steep. From Cody, drive 3.9 miles west on US Hwy 14/16/20 past the rodeo grounds and turn left at Cedar Mountain Trail Rides. Stay left and continue up the mountain to the eleventh, or last switchback. There’s enough parking for three or so cars. The road can be rutted and rocky but a sedan shouldn't have any trouble. From the point of the switchback walk downhill toward the south. You should see the tops of Visionary to the left and Antelope to the right (west). Cedar Mountain is owned by the Bureau of Land Management with private property at the top. Be respectful and take out your trash. The mountain rocks with drinking parties in the summer and trash is building up in certain popular spots. No fees, no water and no bathrooms. Leashed pets are permitted, as is camping. Watch for rattlesnakes.